The coolest new technology I have seen for disinfection. Home ⁄ Articles & Posts ⁄ The coolest new technology I have seen for disinfection. For years we have experienced challenges with airborne pathogens. Tuberculosis has definitely been held at bay but just the same, like most people in our industry I am always looking over my shoulder for the next strain or unknown virus. Recently the sanitation industry has focused on new ways to clean and disinfect healthcare facilities. 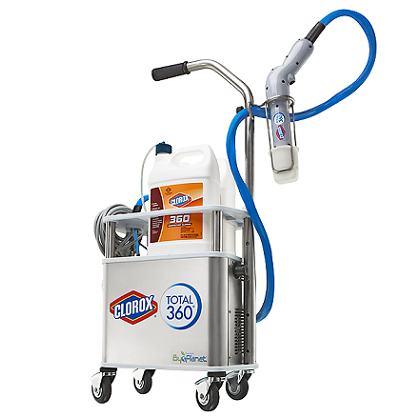 Clorox developed the electrostatic disinfection system followed up by a variety of other manufacturers. Minuteman developed a truly effective application system. The real challenge with these systems lays in safety and application. Regardless of what you are applying there is a purpose: To kill pathogens. That considered we all know what the plan is, how do we do so safely. Given a bit of time and some products that will work effectively when positively charged through the magic of electrostatic charge. No doubt that disinfectants work when misted and directly applied. But what happens on a larger scale when we create a version smaller than a droplet? It certainly is worth looking at this technology for outbreak situations. The hope is that someone can safely develop a technology that gives all of us comfort. Explain Acids in Cleaning to Me! Copyright © 2019 Corporate Facility Supply – The Number One Cleaning, Paper, Safety, Equipment, Product Store in Niagara. All rights reserved. Design by ThemeGrill. Powered by WordPress.